Polyhydramnios refers to an abnormally large level of amniotic fluid during pregnancy. It is defined by an amniotic fluid index that is above the 95th centile for gestational age. In this article, we shall look at the causes, clinical assessment and management of polyhydramnios. It is predominantly comprised of the fetal urine output, with small contributions from the placenta and some fetal secretions (e.g. respiratory, oral). Macrosomia – larger babies produce more urine. Fig 2 – Twin to twin transfusion syndrome, a complication of a disproportionate blood supply in twin pregnancies. It is a cause of polyhydramnios. The diagnosis of polyhydramnios is made via ultrasound examination. There are two ways of measuring amniotic fluid; amniotic fluid index (AFI) or maximum pool depth (MPD). They have similar diagnostic accuracy, however AFI is more commonly used. Palpate the uterus – does it feel tense? Karyotyping (if appropriate) – especially if other structural abnormalities are detected, or if the fetus is small. Some viral infections can cause polyhydramnios. Therefore, a TORCH (Toxoplasmosis, Other (Parvovirus), Rubella, Cytomegalovirus, Hepatitis) screen should be undertaken. Maternal red cell antibodies should also be checked; in the UK this is performed routinely at 28 weeks for all pregnancies. 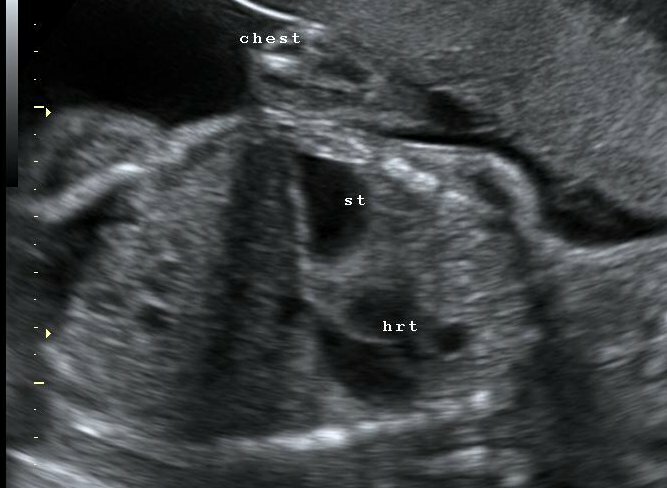 Fig 3 – Ultrasound scan of diaphragmatic hernia – a cause of polyhydramnios. The stomach (st) and heart (hrt) are both within the thorax. No medical intervention is required in the majority of women with polyhydramnios. If the maternal symptoms are severe (e.g breathlessness), an aminoreduction can be considered. It is associated with infection and placental abruption (due to a sudden decrease in intrauterine pressure), and is therefore not performed routinely. Indomethacin can be used to enhance water retention, and thus reduces fetal urine output. It is associated with premature closure of the ductus arteriosus and therefore should not be used beyond 32 weeks. In cases of idiopathic polyhydramnios, the baby must be examined before its first feed by a paediatrician. A nasogastric tube should be passed to ensure there is not a tracheoesophageal fistula or oesophageal atresia. The likely presence of an underlying abnormality or congenital malformation. The increased incidence of preterm labour (due to over-distension of the uterus). Malpresentation (e.g. 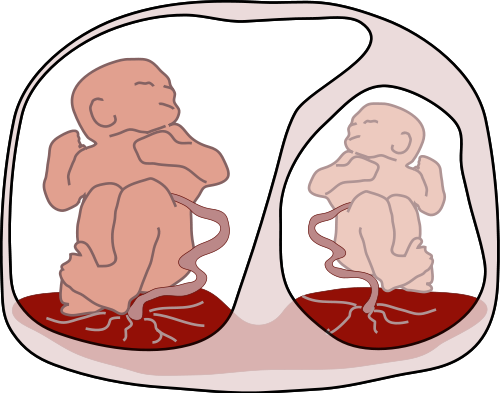 transverse lie, breech presentation) is also more likely – as the fetus has more room to move within the uterine cavity. Care must be taken at rupture of membranes, as there is a higher risk of cord prolapse. After delivery, there is a higher incidence of postpartum haemorrhage, as the uterus has to contract further to achieve haemostasis. 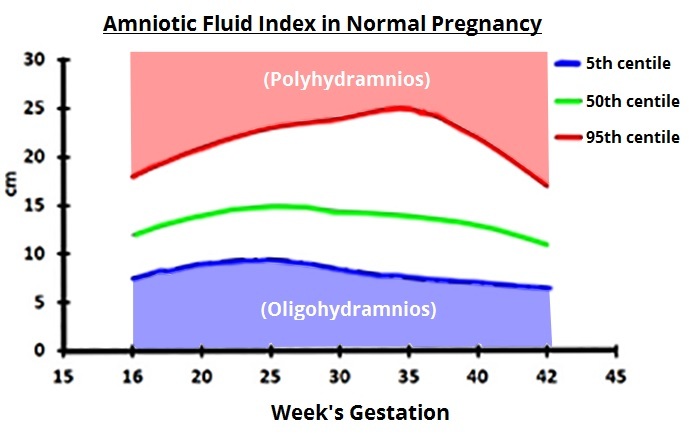 Polyhydramnios is the presence of amniotic fluid >95th centile. The main cause for this is idiopathic, but structural, viral and diabetes as causes must be investigated for. The prognosis is usually good, with only 1% of structurally normal fetuses on ultrasound having an associated congenital abnormality. Which of the following is a cause of polyhydramnios? Which of these infections is not included in a TORCH screen? Indomethacin can be used in the treatment of polyhydramnios. What class of drug is it? Which complication is most associated with an amnioreduction? Which of the following is a direct complication of polyhydramnios?